Easy to serve, reclose and store. WHISKAS® Recloseable Wet Food Trays are as convenient for you as they are tempting for your cat. At WHISKAS® we love cats for their independent spirits but understand they still need love and care. We know that wet food is an important part of a cat's diet but can be difficult to serve and store. That's why we've created WHISKAS® Recloseable Trays - serve up delicious real poultry, meat or seafood and use the lid to close the tray and keep the rest fresh for later. 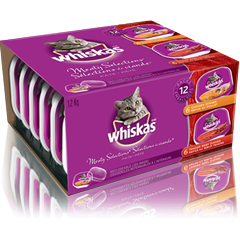 WHISKAS® Savoury Salmon Dinner and 6 x 100g WHISKAS® Whitefish and Tuna Dinner. 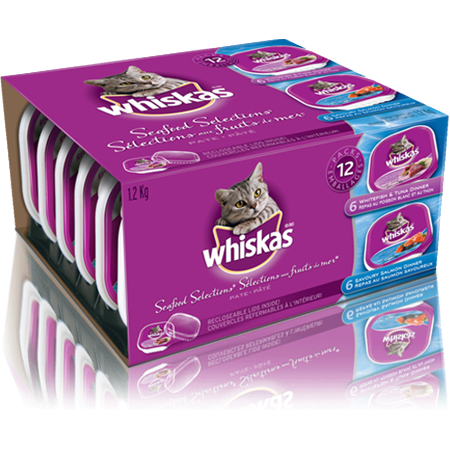 WHISKAS® Recloseable Tray SEAFOOD SELECTIONS® is formulated to meet the nutritional levels established by the AAFCO cat food nutrient profiles for growth and maintenance. Daily Feeding Guide: Feed 2 trays / 8 lb. adult cat or 2-5 trays / kitten daily.